Preparation for the exams strengthens you in areas that you use all the time: sight-reading, transposition, modulation, improvisation, accompaniment, and hymn-playing. Preparation is completely flexible. You can study on your own; you can work with a teacher; you can prepare as a group. The certification process is anonymous and it is fair. No one needs to know anything about it except the one chapter member who makes the arrangements. The examiners never see you and don't know who you are. You could be a high school student or a college professor. 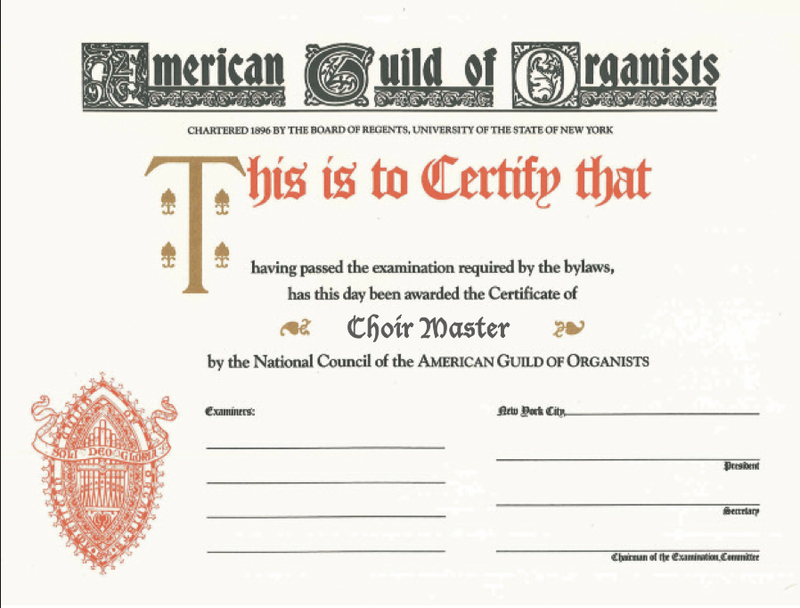 The most important reason to become certified, of course, is that you will be a better organist and a better musician. The preparation will make you more skilled and confident. And the certificate will give you the respect of your employer and your peers, and a justified feeling of accomplishment." (from the AGO Certification document as found at https://www.agohq.org/certification/ ). Anyone who is interested in preparing and taking an exam can find information on exam dates, eligibility, requirements, literature, application procedures and fees on the AGO national website, www.agohq.org/education, under Professional Certification. There are also preparation materials and resources available from the national headquarters online store which can be accessed from the same page. Deanna Muro, for further information at deanna8980@yahoo.com.